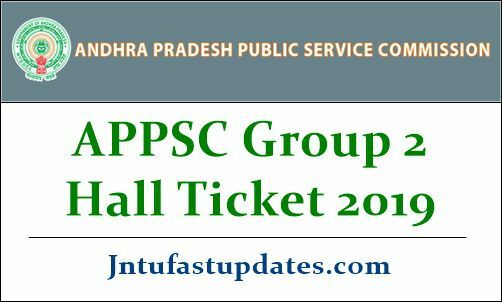 APPSC Group 2 Hall Ticket 2019: Andhra Pradesh Public Service Commission (APPSC) has scheduled the Group 2 prelims examination on 5th May 2019. The examination is going to happen in many places across the Andhra Pradesh state. A huge number of aspirants are going to compete for the Group II posts this year. As the competition is tough, the hopefuls have to show their special effort to get shortlisted in the selection process. To attend the written test round, aspirants must need to download APPSC Group 2 hall ticket, which will be shortly accessible on APPSC website, psc.ap.gov.in. Hall ticket is the main document to attend the examination. Competitors must show their hall tickets at the time of verification to enter the exam hall. Otherwise, the invigilators will not let the candidates proceed with the examination. Hence the hopefuls have to make sure to carry the hall tickets while going to the examination. Hall ticket availability date, downloading process, and more details explained in this article for the reference of aspirants. Andhra Pradesh Public Service Commission works for the AP State government related works. APPSC provides affiliation for various government organizations in the state. The Andhra Pradesh PSC releases various notifications ever year to hire suitable aspirants into various designations in government organizations. APPSC has now come up with Group 2, Group 2, and Group 3 notifications to hire the suitable aspirants into various vacant positions. Recently, the APPSC released the Group II notification for 449 Asst., Section Officer, Asst., Registrar, Extn., Officer, Dy. Tahsildar, Executive Officer Gr.I, Municipal Commr., Gr.III, Senior Accountants, Excise Sub-Inspectors posts. Many of the aspirants ambitious to get AP State government jobs have applied for the announced posts during the application dates. The selection of aspirants will be done through preliminary examination, mains examination, and interview rounds. Candidates have to clear all these rounds with good merit to get the jobs. Allotment of jobs will be done only on the basis of merit. All the hopefuls competing for the AP Group 2 examination can download the hall tickets 1 week before the examination date (approximately). As the examination is scheduled on 5th May, the hall ticket is expected to release in the last week of April. Hence all the competitors who are going to attend the preliminary examination will have to wait for a few more days to download the hall tickets. The hall ticket contains the information of the candidate and examination details. The candidates should take their seats at the prescribed time before the commencement of the examination. Biometric identification would be conducted before entry into examination hall. The entry time would be mentioned in the hall ticket. The starting time of each examination paper and the entry time would be mentioned in the hall ticket. Search the APPSC Group 2 Hall Ticket download link in organization website. Check the information in APPSC Group II Hall Ticket 2019. Wen v will download hall ticket 2019? ?